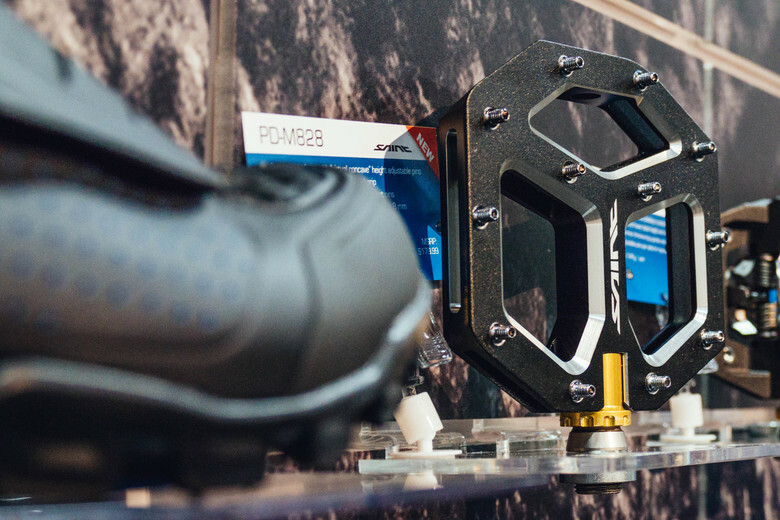 Shimano continues to grow its line of shoes and pedals for everything from trail and enduro to downhill. Clips or flats, pick your poison! Recognizing that 90% of Shimano's athletes ride clipless, Shimano decided it was time to make a clipless pedal within their Saint family of products. They've got a very thin pedal body to help you avoid as many rocks as possible, and adjustable pins on each side to allow you to customize the feel. They weigh in at 546 grams per pair and cost $159.99 USD. On the flat pedal side, Shimano has made several key updates and is introducing a few new models. 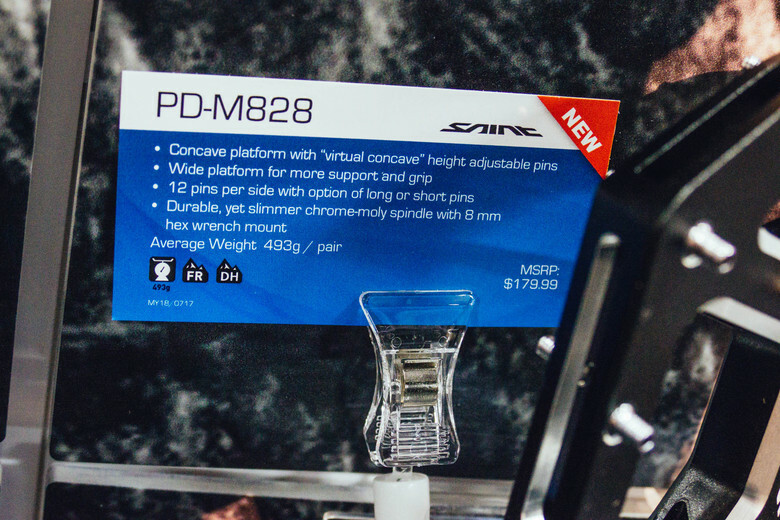 The Saint PD-M828 flat pedal gets a bit thinner for the new year thanks to a slimmer chromoly spindle with an 8mm hex wrench mount. They weigh in at 493 grams per pair, have 12 pins per side, and cost $179.99 USD. Shimano's new XT flat pedal, the XT PD-M8040 comes in two different platform sizes so you can optimize the feel of the pedal in relation to the size of your foot. These concave pedals have 10 pins per side and ship with both long and short pins, they weigh in at 346 grams per pair and cost $99.99 USD regardless of the size selected. The final update to the flat pedal line is the new PD-GR500 platform pedal, which at $79.99 USD is Shimano's budget offering. Having tested many pedals we know that this is an impressive price point to reach, especially considering that these pedals have a chromoly spindle and spin on sealed cartridge bearings. They come in two colors, silver and black, and weigh 533 grams per pair. Finally, Shimano introduced us to a few pairs of new shoes where the rubber outsole has been developed in partnership with Michelin. The new GR9 is a flat pedal shoe aimed at the enduro/downhill market, with a Michelin outsole that aims to provide good grip both on and off the pedals. An armored lace shield and a reinforced toebox provide extra protection from the elements, while the materials used should ensure that the shoes does not take on excessive amounts of water during long and wet days out. The GR9 will retail for $150 USD. The new GR7 is billed as an all-around SPD shoe for trail and enduro riding. A Michelin rubber outsole provides extra grip both on and off the bike, while the perforated synthetic upper helps with heat management. The GR7 weighs in at 366 grams and costs $130 USD. The AM9 is Shimano's flagship enduro/downhill shoe. It features a "pedal channel" to help with stability even when not clipped in, an armored lace shield and toebox protection. The AM9 weighs in at 400 grams and retails for $160 USD. For more information, head on over to www.bike.shimano.com. Do the M8040 pedals use cartridge bearings? Also, looks like they finally updated the Saint MX80 with the GR500 pedals. So I'll be able to get them on CRC for $65 in a few weeks?? Sweet. Looks like they got the same designer who did Ion's shoes to do those new ones. Looks like I'll be getting some dmr v twins! help me please understand all these DH clipped pedals that are "fixed". The best thing about shimano DH clipless was they rotated slightly within the cage do you could pop into them easier. The crank brothers are the only ones now that (for lack of a better term" inwardly moving so that you can get clicked in when you're panicking. 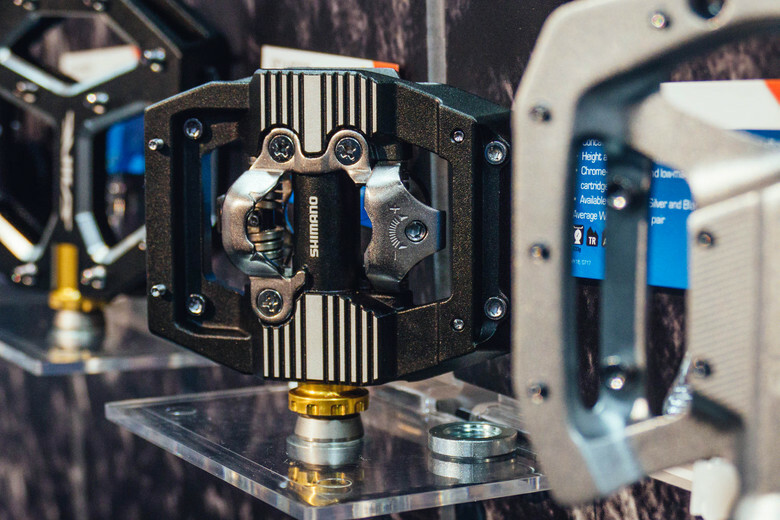 They lost their tilting platform patent, and then resorted to simpler, cheaper way to manufacture pedals. And then they started marketing it as an improvement. Having rode shimano DX pedals for many years I've recently switched to HT X2 DH pedals and I've found that I actually much prefer the non-rotating clip. This is probably just personal preference but I love how the clip is in the same spot every time I go to clip in. The slight movement on the DX is annoying now that I've ridden without it. Also I think that unclipping is slightly easier without that movement. $180 flat pedal that weighs 500gr per pair and a $100 pedal that weighs 343gr per pair and is available in two sizes... what? Looks like someone at Shimano got their KPIs mixed up. I agree regarding price, but as a quick weight counter point: one of our team riders has snapped 3 pedals this month. And he gets flow from a very well respected company, but still has to pay $$ for them. So for some riders, the current fad of slim/light/wide pedals just does not work. For sure strength is paramount to weight, but from a company like Shimano, I expect the vector product to be expensive but also ticking all of the boxes. The Saint line of products ought to be like XTR- the best products for racing. For DH, that should be light but more importantly the strongest with a price tag to match. The Zee line should be the "affordable but heavier" DH product line. In my opinion, it just seems like they didn't give enough time or care to do it right. Redesigning their shoes every single year seems a little weird to me... I have been really happy with my ME5's but pretty disappointed with the previous AM9's (not comfortable, weird sizing and very soft sole). Those looking at the DH clipless pedal might want to look at Funn Mambas or DMR's offering which are on the market for less and use shimano cleats. Personally I tried the Mambas, but ended up returning to a XT trail pedal as the wider platform and pins didnt do much for me and actively hindered easy engagement on the cleat. 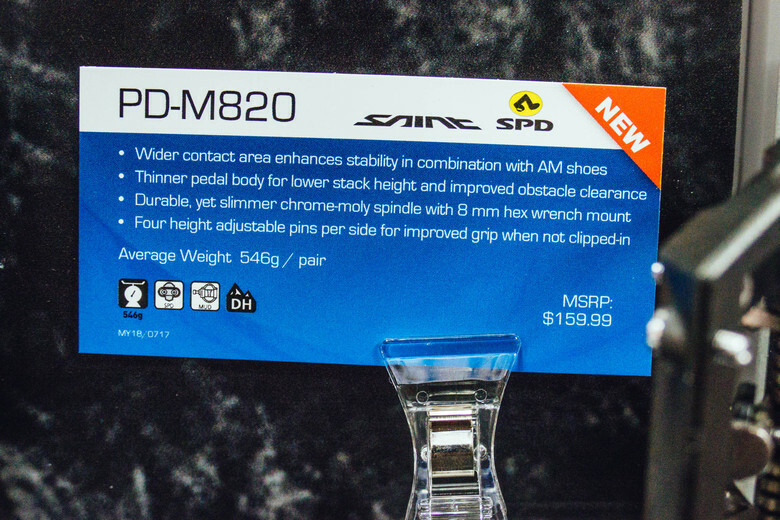 Shimano has been lowering the bar with respect to their platform SPD pedals for a long time now. The best thing about them used to be the pedal pivoting with respect to the cage, which always left the engaging mechanism ready to receive the cleat. Not they just add more metal to the pedal and call the day off. Not to mention brakes. I used to love Shimano brakes, but their production standards and quality control have tanked in recent years.